Expandol is a superior quality high expansion fire fighting foam concentrate for extinguishing and securing flammable hydrocarbon liquid fires. Expandol produces large-volumes of high expansion foam for use in total flooding applications, marine fire fighting and Liquefied Natural Gas (LNG) applications. 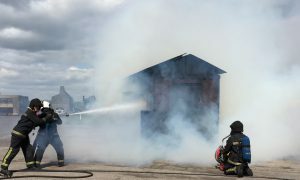 Initial contact with fire generates a large volume of steam reducing the available oxygen to create an inert atmosphere. The high water content of medium expansion foam produces a valuable cooling effect. The large volume of foam generated engulfs the area and totally seals off and extinguishes any remaining fires.